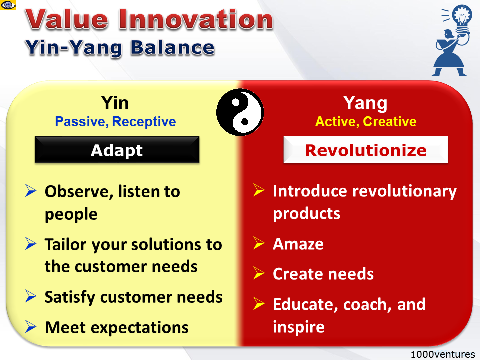 Value Innovation is the → search for new, radically different value curves. Why do some companies achieve sustained high growth in both → revenues and profits? In a five-year study of high-growth companies and their less successful competitors, researches3 found that the answer lies in the way each group approach strategy. The difference in approach was not a matter of managers choosing one analytical tool or planning model over another. The difference was in the companies' fundamental, implicit assumptions about strategy. The less successful companies took a conventional approach: their strategic thinking was dominated by the idea of staying ahead of the competition. In stark contrast, the high-growth companies and → market leaders paid little attention to matching or beating their rivals. Instead, they sought to make their competitors irrelevant through a strategic logic called value innovation. 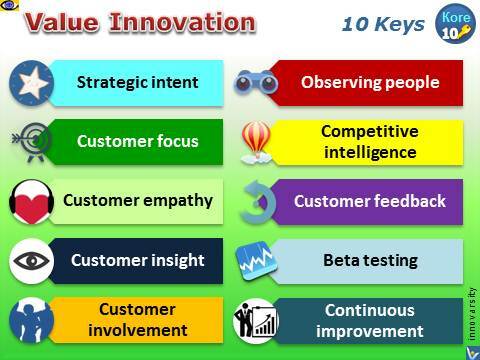 The value innovation concept provides a relevant support for questioning product/market strategies as well as underlying assumptions. You must examine radically what constitutes real value for customers by asking fundamental questions: what value offering need to be introduced or increased to meet customer needs? what value offerings can be reduced or eliminated, because they do not constitute real value for customers? "The biggest mistake anyone can make is to focus on the competitor. 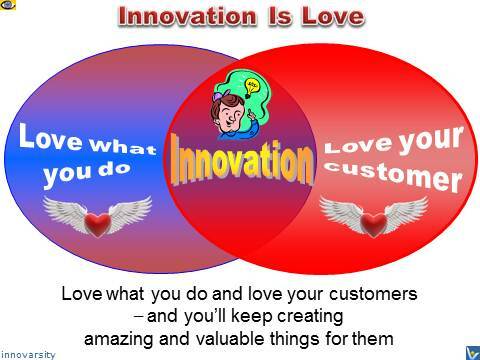 Customer-Driven Innovation is not a one-time event or a slogan, it's a philosophy and a mindset. You should live this principle daily. Observe people, live your customers' life, watch how they use your product to learn what works and what doesn't work. Encourage experimentation and risk taking. How and where companies should compete is rapidly changing in an eEconomy that has compelled organizations worldwide to re-think how best to deliver value to customers. Evolving, innovative → value propositions and customer engagement strategies can drive growth and create distinct competitive advantages – positions of cost leadership, differentiation, or both. Searching questions can help you discover new opportunities, uncover the roots of a problem, and find creative solutions to it. Open your mind to what is possible. Asking searching questions starts with challenging assumptions. Ask also your customer what they want and find common themes in response to your questioning. The asking of searching questions should be done continuously by all levels of your organizations, but especially by corporate leaders. 4. "Blur: The Speed of Change in the Connected Economy", Davis, S. and Meyer, C.